Chronic Kidney Disease, also known as Chronic Renal Failure (CRF) is a common condition in aging cats. It is the result of a gradual decrease in kidney function. Healthy kidneys act like a filter to remove waste products from the body. They regulate electrolytes such as potassium and phosphorous, and they produce erythropoietin which stimulates red blood cell production. Kidneys produce rennin, which contributes toward regulating blood pressure. Kidneys also play a major role in turning vitamin D into its active form, which controls calcium balance in the body. When kidney function becomes compromised, symptoms may be subtle at first, but the disease is progressive and irreversible, which is why early diagnosis and intervention is so important. Researchers at the Oregon State University and IDEXX Laboratories have developed a new biomarker called SDMA, short for symmetric dimethylarginine, that can provide earlier detection of kidney disease. The cats in the study were housed at the Science and Technology Center of Hill’s Pet Nutrition Inc. The purpose of the study was to determine whether feeding cats reduced protein and phosphorus foods with added fish oil, L-carnitine, and medium-chain triglycerides (MCT) altered serum biomarkers of renal function. Currently, kidney disease is diagnosed by testing blood levels of creatinine and BUN, and by urinalysis. However, since creatinine levels are dependent on lean body mass, an underweight cat in renal failure may have normal blood creatinine levels, so the diagnosis of kidney failure could be missed with bloodwork alone. SDMA is not influenced by muscle mass. Earlier detection will lead to more successful treatment via medical and dietary means. 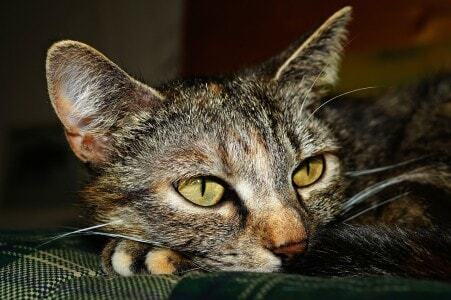 Many veterinarians recommend a low-protein “prescription diet” for cats in renal failure, but there is some controversy regarding protein restriction, especially in the early stages of the disease. I recommend working with a holistic veterinarian in formulating a diet for cats with kidney disease. Unfortunately, the SDMA test is not commercially available yet and there is no information about when IDEXX will release the test at this time. For more information about the study, and to read the abstract, click here. « Conscious Cat Sunday: Do You Love Your Life?